Nikki Fiske, a teacher who said President Donald Trump's senior advisor for policy "ate glue" and was a "strange dude" while in elementary school, has been suspended and placed on home assignment by the Santa Monica-Malibu Unified School District pending a decision about her revelations. 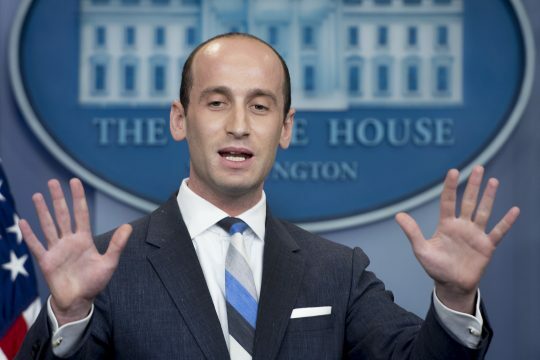 Fiske told Benjamin Svetkey of The Hollywood Reporter that when she taught Stephen Miller in 1993, the third grader would "take a bottle of glue — we didn't have glue sticks in those days — and he would pour the glue on his arm, let it dry, peel it off and then eat it." She also compared him to a disheveled comic strip character. "Do you remember that character in Peanuts, the one called Pig Pen, with the dust cloud and crumbs flying all around him?" she said. "That was Stephen Miller at 8." According to the LA Times, school district spokesperson Gail Pinsker said that Fiske was put on home assignment because of "her release of student information, including allegations that the release may not have complied with applicable laws and district policies." The claims did not remain with The Hollywood Reporter, though. "This has been picked up by other digital publications and blogs, and some issues have been raised," Pinsker said. Fiske claimed that at the time, she was concerned about Miller socially but not academically. Miller is a graduate of Duke University and has worked for numerous congressmen, including Rep. Michele Bachmann (R., Minn), Rep. John Shadegg (R., Ariz.), Sen. Jeff Sessions (R., Ala.), and Rep. Dave Brat (R., Va.). Others have raised concerns with Fiske going to the media with such claims. Becket Adams wrote in the Washington Examiner, "What kind of teacher goes to an entertainment newspaper with gossip about an 8-year-old boy? Hell, forget that she’s a teacher. What kind of human being does that?" This entry was posted in Politics and tagged Stephen Miller. Bookmark the permalink.